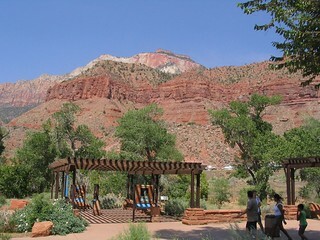 The park is located in southwestern Utah in Washington, Iron and Kane counties. Geomorphically, it is located on the Markagunt and Kolob plateaus, at the intersection of three North American geographic provinces: the Colorado Plateaus, the Great Basin, and the Mojave Desert. The northern part of the park is known as the Kolob Canyons section and is accessible from Interstate 15, exit 40.